Change is in the air, literally, for Toronto’s Ryerson University, with University President Sheldon Levy announcing plans for an ambitious new facility termed the Church Street Development. Proposed design images feature a structure as impressive and lofty as the programs it will house, including the School of Nutrition, the School of Occupational and Public Health, the Midwifery Education Program and the Daphne Cockwell School of Nursing. 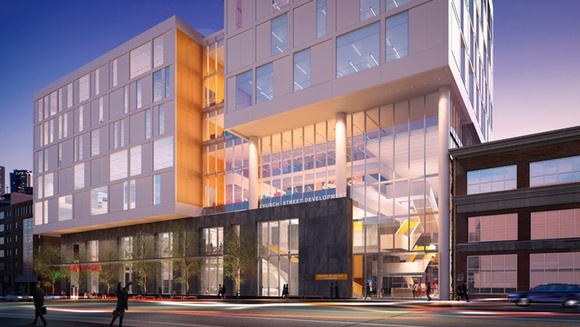 The four Faculty of Community Services programs will fit nicely into the new eight-story podium, with a multi-story tower to the north that will be home to a new 250-bed residence for Ryerson students. With new research labs, clinical experience suites, and a Fabrication Zone with 3D printers, robotic arms, a laser cutter and CNC lathes for prototyping, the Church Street Development will create an exceptional educational environment for Ryerson students. Not only will the programs focus on protecting the health and wellbeing of the community, the building itself is being designed by the internationally known architectural firm Perkins + Will, following green LEED standards to help protect the environment. Thanks to generous monetary support from the Government of Ontario, who recognizes the importance of training the province’s future health care sector, construction on the Church Street Development is slated to being in the Fall of 2015, with completion of the project forecast to be in 2018.